Henry Banister of Coleshill Longcase Oak late 18C - Height 94in. This Longcase Oak Archive's Maker - H. ( Henry ) Banister of Coleshill. ( East of Birmingham ).Recorded circa 1750.Also spelt Bannister. 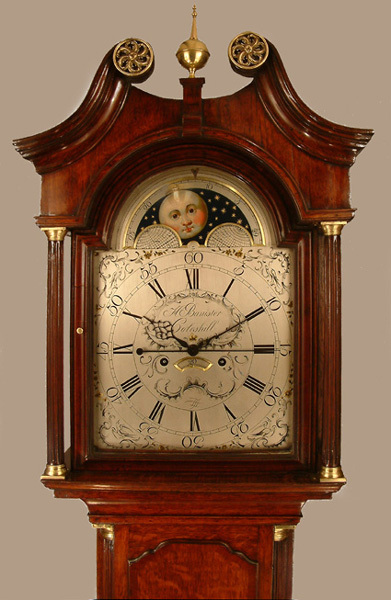 Long door mahogany crossbanded oak case with swan neck pediment, reeded quarter columns to trunk and bracket feet. 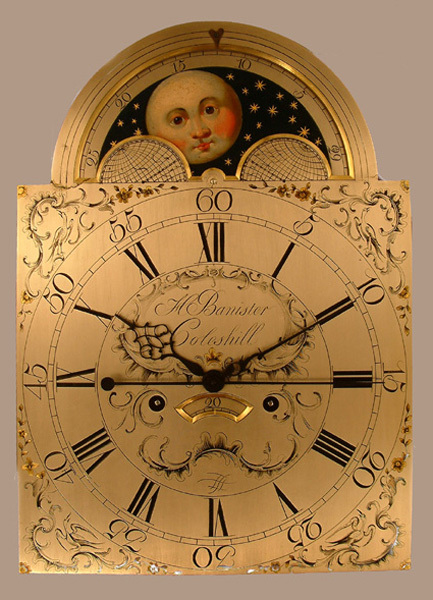 13" breakarch exquisitely engraved and silvered brass dial with moonphases to arch, subsidiary seconds dial, date aperture and centre sweep seconds. Well executed, four pillar, 8 day movement with deadbeat escapement and hourly ( rack ) striking on a single bell. H. ( Henry ) Banister of Coleshill. ( East of Birmingham ).Recorded circa 1750.Also spelt Bannister. Dating by style, late 18C. 94" ( 239 cms. ) or 91" ( 231 cms. ) ex finial.